I was employed by Geloso S.p.A. in the period 1956-66, working in the area of experimental black & white TV, and later on the early research on colour TV sets. At that time the firm, then based in Milan, Viale Brenta 29, had a workforce of around 800, without considering the many hundreds employed by its related companies. At this facility anyone who wanted to or needed to could frequent production departments or design workshops. It was not unusual to run into Giovanni Geloso himself or his closest associates, and without any formality you could get into discussions with them, about technical problems or other issues. The organization structure was such that it was possible to make, internally, all the electrical and mechanical parts of an electronic device. The company could therefore get started, at any time on a new project, often a brainwave of “The Engineer” who always had his pen at the ready to jot down a sketch of the product he had in mind. A memorable example is provided by the construction diagrams for transformer winding machines: he passed them over almost complete to his draughtsmen so they could come up with a “more presentable” version. There’s a particular point I’d like to make here about Giovanni Geloso. He left his home region of Liguria for New York, where he worked for the Pilot Company. He later returned and was possibly the only emigrant ever to have made his fortune back in Italy, in the ‘30s, after setting up (in Milan, Via Sebenico 7) a manufacturing business that operated for over forty years. Mention must also be made here of the contribution made by the first design engineer to work for Giovanni Geloso. 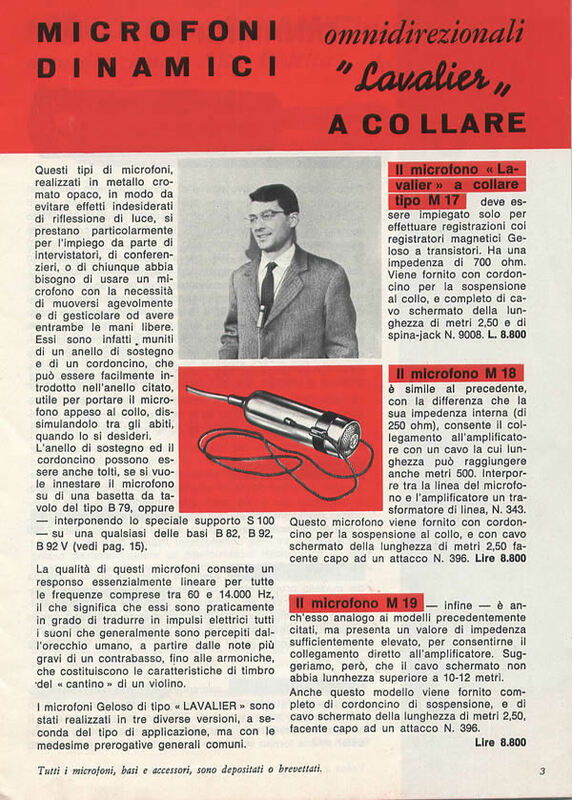 Luigi Negri, from Piacenza, was the brilliant mind behind major product developments: firstly radio receiving sets, then frequency modulators and lastly the first TV set with intercarrier system presented at the Milan Trade Fair in 1949. Another important aspect of Geloso S.p.A. was the corporate philosophy regarding relations with its workforce. With his farsighted views about progress and the future, Giovanni Geloso had great faith in young people: he helped them by offering scholarships and encouraging them to diversify their experience within the company environment. I remember services and facilities introduced for his workers: canteen, library, recreational activities, nursery (women – from Milan’s Porta Romana district – accounted for a significant portion of the workforce), internal medical services, available every day. The canteen was open in the late afternoon too, to provide meals for young apprentices who went straight from work to evening classes; loans were offered at favourable rates to employees keen to buy their first home; and much more besides. All in all, it was a family business but it was run by an enlightened man. Possibly the lack of a suitable successor brought about the demise of a business model of which Olivetti, founded by the engineer Adriano Olivetti, was – in my opinion – Italy’s only other significant example, though admittedly on a different scale. I want to end this “profile” of what Geloso – man and company – has meant to me by thanking my friends Ezio Di Chiaro, his son Paolo, and Giammario Garello. They also happen to be among the greatest collectors of Geloso products, especially in the field of magnetic recording and amplifying devices. It is to them that we owe the existence of this website which will – I’m sure – have frequent visits and updates from the countless hams who still love to ride the airwaves.